My daughter Cara requested a cardigan made with “small yarn, and no lacy stuff”. This pattern is what I came up with, and she was pleased with the results. This is a regular length, round neck cardigan with drop shoulders, full length sleeves and single band collar. 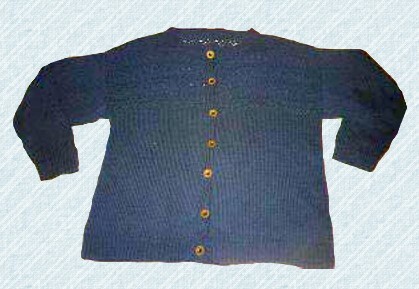 It is knit in stockinette stitch, with eyelet bands on the yoke. I used “Opium”, a cotton/silk blend (a DK weight, I think), with a gauge of 22 sts & 26 rows=4″ in st. st. on #6 needles. I think it would have been a “crisper”sweater done in a wool yarn; Opium is a very pretty, but rather a soft yarn for a cardigan. I used approximately eleven 50 gram skeins for the cardigan. The chest measurement is about 41”. stockinette stitch. Work even until piece measures 15 1/2” from beginning, ending with a knit row. ssk: Left slanting decrease. Slip 2 sts separately to right needle as if to knit. Then knit these 2 sts together by slipping left needle into them from left to right. 2 sts become 1.
k2 tog: knit 2 sts together. P2 tog-b: purl 2 sts together through the back loop of sts. pass slipped st over the k2tog stitch. Repeat rows 1-16 5 times. The yoke should measure 10 1/2”, the total length should be 26”. Bind off 37 sts. beginning next 2 rows, place remaining 38 sts. on holder for neck. 22 1/2” from beginning, ending with a right side row. Shape Neck: wrong side facing , work 44 sts in pattern, place last 12 sts. on holder for neck. Decrease 1 st. at neck edge (right end of piece) every row 7 times — 37 sts. remain. Work even in pattern until piece measures 10 1/2” from beginning of pattern, total length 26”. Bind off shoulder sts. Work left front as for right front, reversing neck shaping. Cast on 45 sts. on #4 needles. Work K1, P1 ribbing for 2:, increasing 5 sts evenly across the last row for 50 sts. total. Change to #6 needles and stockinette stitch. Work even for 1”, then increase 1 st at each end of next row, then every following 4th row 25 times to 102 sts. Work even until sleeve measures 20” from beginning. Bind off all sts. band, when slightly stretched. Bind off and sew to left front of cardigan. 18”, and 21 1/2”. To make buttonholes: with right side of work facing, rib 2 sts, cast off next 2 sts, rib to end. Next row, rib 4 sts, cast on 2 sts, rib to end. Sew buttonhole band to right front, sew sleeve and side seams. Sew on 7 buttons. Wear and enjoy!